Under a full moon near midnight on September 11, 1894, Henry Cox, Charles Nichols, and Deroy Foster, all of Burlington, Massachusetts, roused Constable Everett Whitton Livingston at his home on Billerica‘s Pond Street. Deroy Foster, a retired milkman, had been robbed of his week’s pay ($7.50) by three men in a covered wagon on today’s Winn Street in Burlington at the intersection of Peach Orchard Lane. Foster, Cox, and Nichols had followed the covered wagon’s tracks into the Pinehurst section of Billerica before passing it on Main Street (today’s Boston Road/Route 3A) near Brook (now Webb Brook) Road. They continued on until they reached Billerica Center where they asked at the Stearns House for a constable. With Constable Livingston, a law man well-known locally, the men left Billerica Center, traveling south toward Burlington, on Main Street. Despite the late hour, Livingston awoke quickly – he had been seeking a band of highwaymen responsible for a rash of barn thefts in Pinehurst and Burlington. In the road’s loose dirt, they soon found the covered wagon’s tracks, odd due to its mismatched wheels and its horse’s strangely narrow horseshoes, oddities noticed by Henry Cox’s keen blacksmith eyes. The men passed Brook Road and soon came to Lexington Road. The covered wagon emerged as they passed a clump of birches at the top of Lexington Road, opposite Mrs. Leonard’s place. “There they are!” Foster called. The men proceeded cautiously. “Don’t use your revolvers unless it is a case of life or death”, Constable Livingston warned. When they pulled up opposite the covered wagon, the constable, Nichols, and Cox hopped from their own wagon, leaving Foster to hold the horse. One highwayman stood outside the covered wagon, holding the horse. Constable Livingston approached the man, pointed his revolver at his chest, and announced “I arrest you!”. There was no reading of Miranda rights in those days. Livingston grabbed the man’s collar and handed his handcuffs to Nichols, while Cox approached to help. A struggle ensued when the man protested his innocence. Constable Livingston first noticed the shots. The man they struggled to subdue escaped as Cox, Livingston, and Nichols saw the other two highwaymen emerge from beyond a stone wall. More bullets soon followed. One grazed Livingston’s cheek, another the low branches above the mens’ heads. Livingston, Cox, and Nichols retreated as the gunfire continued, readied their weapons, and fired. Livingston’s revolver jammed. Just then, they heard a cry, behind them. Nichols turned to see that their horse had retreated, pulling their wagon several yards further down Lexington Road. Their horse pranced uneasily and one particularly strong jolt pushed Foster from his seat, to the ground below. Nichols ran to his aid, but found him dead. 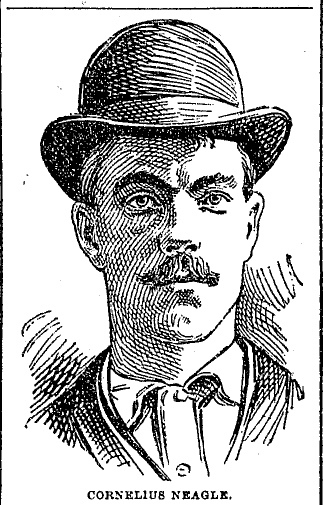 From The Boston Daily Globe, September 13, 1894. 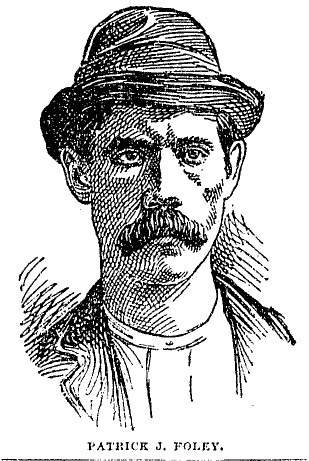 Constable Livingston approached the body and, finding Foster quite dead, announced “This is murder!”. Amidst the commotion, Cox’s horse, and their carriage, disappeared down Lexington Road and out of sight – not to be seen again until the next night, when it was found in Lexington Center. The highwaymen saw their chance and lashed their horse and covered wagon north off Lexington Road and toward town center. Constable Livingston, stranded without a horse, left Nichols and Cox to watch Foster’s body while he broke into a run behind the highwaymen. Their horse quickly outpaced him, but in the quiet of the country night, Livingston followed the creaks and rattles of their fleeing wagon. At the bend on Main Street, he finally lost sight of their wagon, but noted the odd tracks it was still leaving in the dirt of the road. He also noted the horse collars, harnesses, and carriage robes, all stolen from the recent barn raids he had been investigating, that had been dropped from the wagon and strewn into the dirt of the road. He came to the town water pump one mile later, then at the crossing of Andover Road and Main Street. Despite the late hour (it was now after midnight), Livingston found town residents George Smith and James Coulter there, told them of the night’s events, and quickly got their agreement to help pursue the highwaymen. Constable Livingston needed a new horse and carriage, which Coulter procured at the Stearns Boarding House. He also needed to send a doctor to tend to Deroy Foster’s body, growing colder on Lexington Road. Smith fetched Dr. Tyler, who left to meet Cox and Nichols. Full moon overhead, one o’clock in the morning, the men regrouped in Billerica Center, freshly armed with two revolvers and a double-barreled shotgun. The men got in their carriage and rode into the quiet of the night. They soon found and followed the covered wagon’s odd tracks in the dirt of the road. Not long later, they again heard and followed the creaks and rattles of the covered wagon retreating eastward. The men followed the tracks, and the rattles and creaks of the highwaymen’s covered wagon eastward into Tewksbury, Wilmington, and North Woburn. There, they lost the tracks amidst the many wagon tracks near a horse car stable there. Constable Livingston was loathe to give up the chase. Still hearing the wagon far ahead, he persevered, even rousing the horse car stable’s hostler. He directed them to Woburn Center, where they lost the trail entirely. Constable Livingston turned the wagon back toward Billerica, but warned the authorities of each town they passed on their return. Meanwhile, at Lexington Road . . .
Dr. Tyler arrived to help Cox and Nichols move Foster’s body to Benjamin Heald’s barn, which stood at the present-day site of Stromboli’s Express on Boston Road. As dawn came to Billerica, the spreading news brought neighbors to the barn while the autopsy was conducted inside. The neighbors speculated that the men who murdered Foster were the same who had robbed them of their horse collars, harnesses, and cracked corn the night before. One neighbor, Selectman Haskell, told the crowd of the two-and-a-half foot shaft he had recovered recently from nearby Skunk Hill, which had broken off from the highwaymen’s wagon. 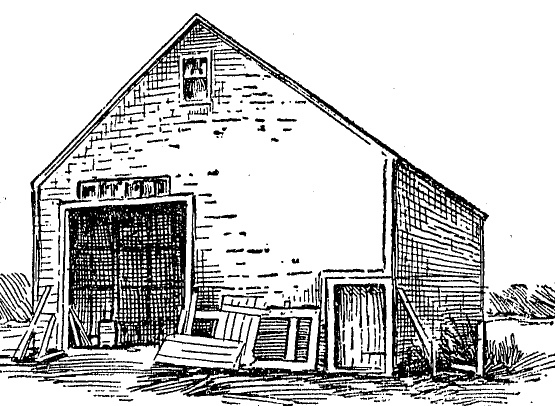 By the day following the murder, Livingston’s efforts began to produce clues which led him and Selectman Haskell to a Somerville stable yard where they found the covered wagon, still sporting twigs and branches clinging from its hurried escape through the country lanes of Billerica. Selectman Haskell then produced the broken shaft from Skunk Hill, which fit perfectly into a piece missing from the wagon. They quickly noted the name etched into the side of the wagon, and within an hour, had arrest Patrick Sullivan, 28, of Somerville. Soon after, they arrested his two accomplices, Patrick Foley, 24, and Cornelius Nagle, 20. 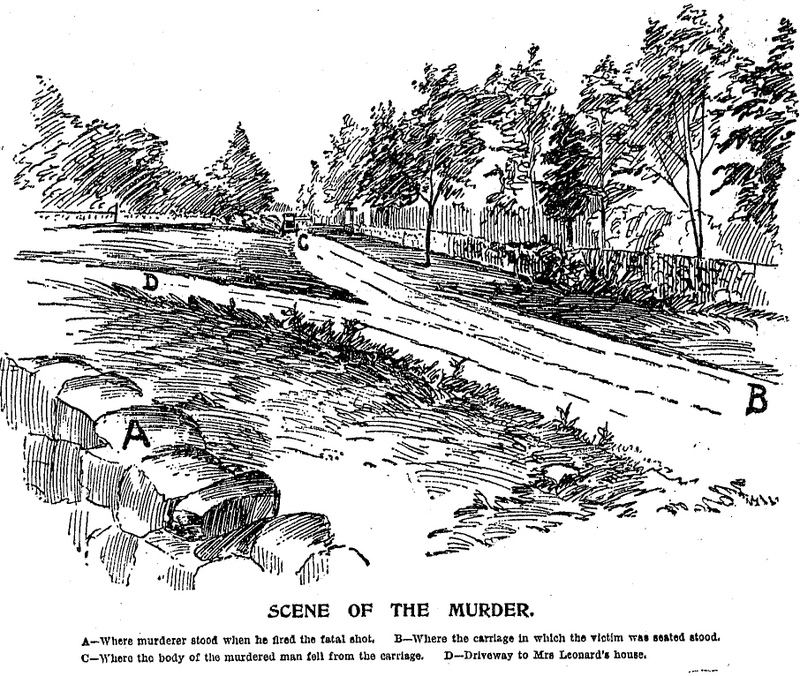 The apprehension of the men only fueled the public’s already rabid interest in the murder. The grand jury for Middlesex County indicted Sullivan, Foley, and Nagle jointly on charges of first-degree murder. Some 200 Middlesex County residents were considered in the juror selection process, and many were dismissed on grounds of their opposition to capital punishment or due to disabilities. One man even claimed he was deaf, which the court clerk knew to be untrue. Despite the clerk’s complaints, the judge dismissed the man, explaining ‘if he’s deaf, we don’t want him, and if he’s a liar, we don’t want him”. So many dismissals eventually exhausted the juror list and the sheriff was ordered to recruit bystanders into the juror pool. The sheriff creativity was proven when he summoned the eventual foreman of the jury, a Lowell grocer named Horace Ela, while he was making his rounds outside the Lowell courthouse in his delivery wagon. The trial was widely followed in the press. The prosecution’s alleged that the men had come to Billerica on that September night to steal from the country barns, determined to eliminate anyone who opposed them, even if that meant murder. They charged that their resistance to a lawful arrest led to Foster’s death and for that reason, they were guilty of murder. The defense argued that the men had never left their families in Somerville on the night of the murder and therefore could not have set foot in Billerica or be responsible for Foster’s death. In June 1895, the trial came to its end, with the men being found guilty of second-degree murder. in January 1896, all exceptions had been resolved and the men were sentenced to life prison terms in Massachusetts State Prison. In 1904 and 1917, respectively, Nagle and Sullivan were ultimately pardoned. Second thoughts about their guilt, and the realization that no evidence could be presented to conclusively prove who had fired the fatal shot that killed Foster, led to the pardons. They came too late for Patrick Foley, however. 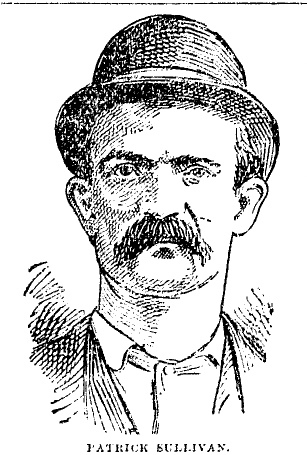 He died in prison in 1902 of tuberculosis. Sherman, Edgar Jay. Some Recollections of a Long Life. Salem, MA: Newcomb & Gauss, 1908. Print. 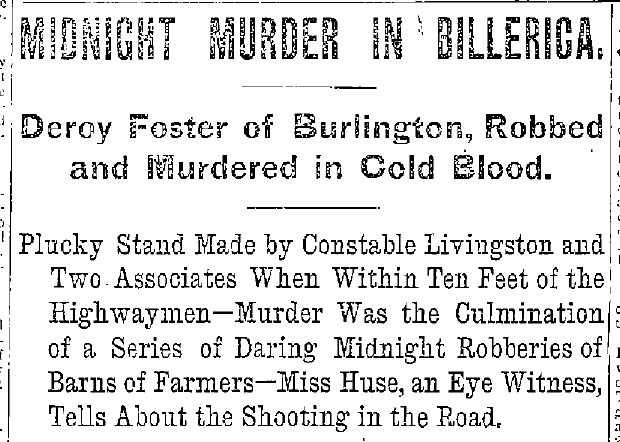 “Midnight Murder in Billerica.” The Lowell Daily Sun. [Lowell, Massachusetts] 12 Sept. 1894: 1. “Two Men Held on Suspicion.” The Boston Daily Globe. [Boston, Massachusetts] 13 Sept 1894: 1, 5. “Under Arrest.” The Lowell Daily Sun. [Lowell, Massachusetts] 13 Sept. 1894: 1. “Men Identified.” The Lowell Daily Sun. [Lowell, Massachusetts] 14 Sept. 1894: 1. “Crowded Court.” The Lowell Daily Sun. [Lowell, Massachusetts] 24 Sept. 1894: 1. “Foster Tragedy.” The Lowell Daily Sun. [Lowell, Massachusetts] 25 Sept. 1894: 1. “Now the Defence.” The Lowell Daily Sun. [Lowell, Massachusetts] 26 Sept. 1894: 4. “The Murder of ’94 Caused Great Excitement Out in Peaceful Billerica.” The Lowell Sun. [Lowell, Massachusetts] 3 Aug 1935: 5. “For Nagle.” The Boston Globe. [Boston, Massachusetts] 18 May 1904: 8. “Freed After 23 Year Term.” The Lowell Sun. [Lowell, Massachusetts] 27 September 1917: 5.